Love, Lenore: stripes for spring. 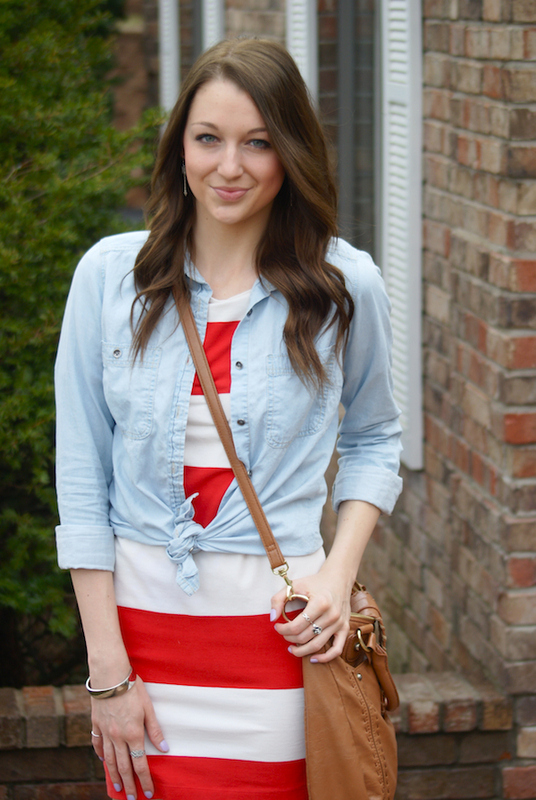 I've previously styled this fun spring/summer dress here and here! Love your style! Looking forward to following along! You look adorable, love this cute dress. Visiting from Rita's blog! Great outfit... stripes are my favorite and I love ankle boots. Super cute! You both look great in stripes! Hi girly! Thank you so much for putting this post together! It turned out perfect! Btw...I read your comment and I feel the same way! One of the reasons I love blogging is b/c I get to meet and connect with genuinely nice people like you:)! I love the nautical vibe of this outfit! 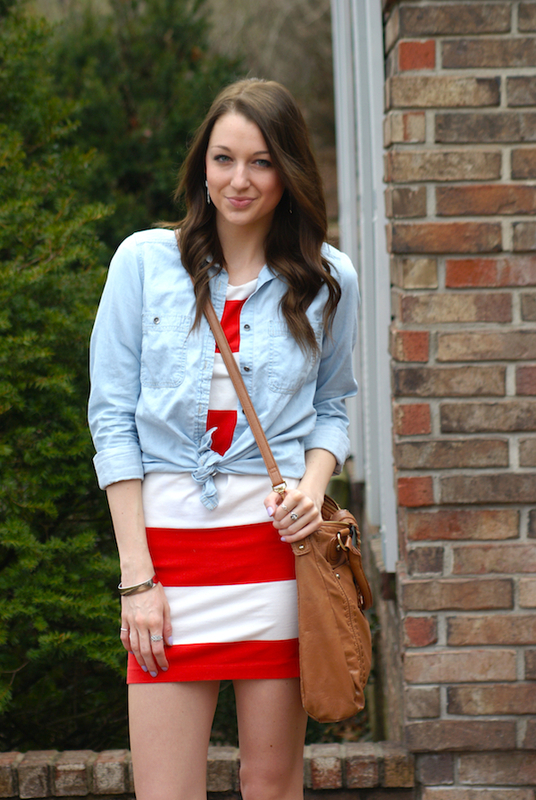 The red stripes are so cute with the tied chambray shirt:) And ahhh those shoes are so cute. Heading over to Rita's blog right now to see her outfit! Love this girl!! So so cute. I love knotting shirts! The outfit in your header is TOO GORGEOUS! And the outfits here are just as lovely - I love nautical stripes too! Hi!!! I love your striped dress!! the color is beautiful and whit this denim shirt is a perfect look!! Kisses!!! Hi dear, stripes are my favourite type of print, I can never tire of it, love your red and white dress, its elegant and still retains a casual appeal. Adore the savvy styling..
You both look gorgeous! I love stripes (my closet is over flowing with them! ), so naturally both of these outfits are right up my alley! This is SO cute! Is that a chambray shirt or just a blue button up? It's super cute regardless. 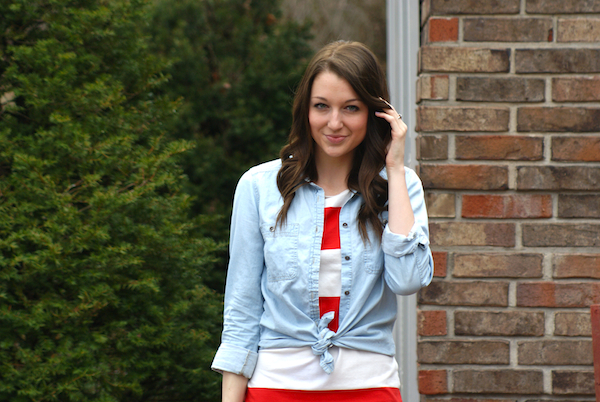 I'm doing a post tomorrow on chambray in the spring and this was exactly the type of thing I had in mind. Check it out tomorrow if you can! You and Rita are my 2 favorite! You girls are so sweet and wish I know you both more than just on the blog :) Cute, girls! Love this post. Stripes are my favorite! Adore Rita , you both look amazing . Those are the loveliest stripes I've seen lately.....huge & colorful!!! You both look amazing. I love the colors on your combination.